Often referred to by the Michigan Nature Association as its “jewel in the crown,” Dowagiac Woods is the largest MNA sanctuary in the Lower Peninsula. The 384-acre wooded preserve is located just west of the city of Dowagiac in the northwest corner of Cass County. Bordered on the east by the Dowagiac River, the sanctuary’s dominant natural communities are floodplain forest, southern hardwood swamps and mesic southern forests. 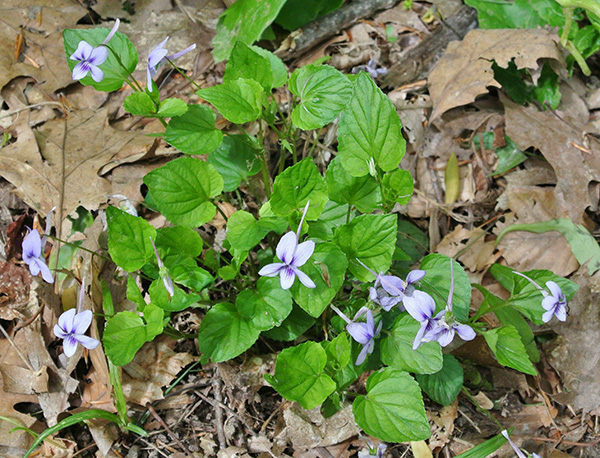 But Dowagiac Woods is best known for its diverse and profuse display of wildflowers from mid-April to mid-May when more than 50 species of plants will be in bloom. 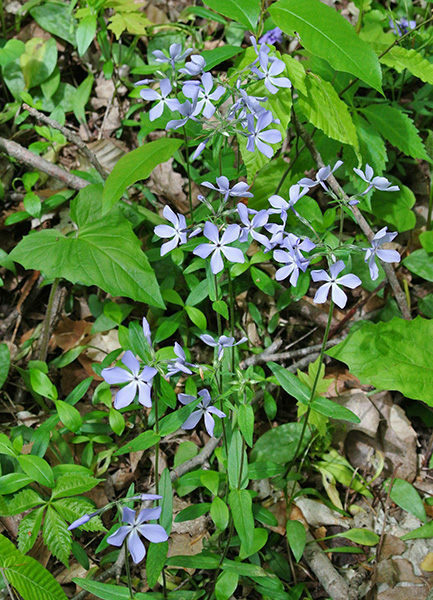 It was a wildflower that lead to preservation of the area when a MNA member reported in 1975 that the Blue-Eyed Mary (Collinsia verna), a stunning flower with blue and white petals, grew there. In 1981, the MNA, with the help of $20,000 grant from the Kresge Foundation, raised the $110,000 to purchase 235 acres of the woods. In 2008, an additional 149 acres were added on the north side of the original sanctuary. 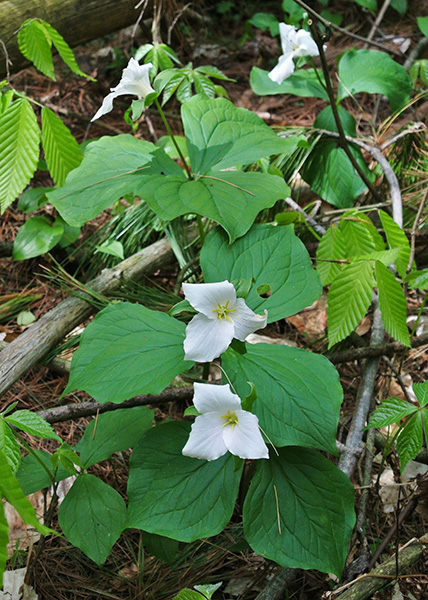 Because the majority of the property has never been plowed or clear-cut, Dowagiac Woods boasts an incredible diversity in plant species. Nearly 50 kinds of trees have been found in the sanctuary, including blue beech, black ash, chinkapin oak, cork elm, black walnut and hackberry. The Ohio buckeye tree thrives in the preserve and is the first tree to leaf out in the spring, blooming in late April. Dowagiac Woods is a haven for four animals in danger of becoming extinct in Michigan; the black rat snake, Greek valerian, box turtle and spotted turtle, while hikers often spot or hear yellow warblers, northern yellowthroat, Acadian flycatcher and ruffed grouse. The sanctuary’s trail system totals 2.5 miles. The hike described here is a 2-mile walk combining the Main Trail and the Square Pond Loop Trail. 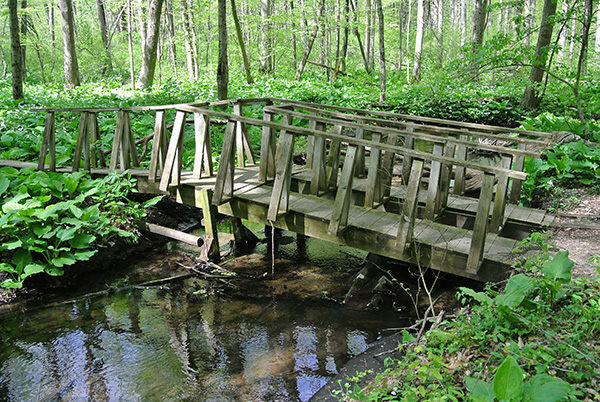 The trails are level, easy to follow and – thanks to extensive boardwalks and bridges – relatively dry though the footing can get a little muddy in the spring. Mountain bikes and dogs are banned from Dowagiac Woods. The Main Trail heads into the woods from the information board as a distinct path and quickly comes to a junction. Head left to follow this loop in a clockwise direction and within a third of a mile you’ll arrive at a double bench overlooking Hunter’s Creek. A junction here marks the spur that forms the inner loop. 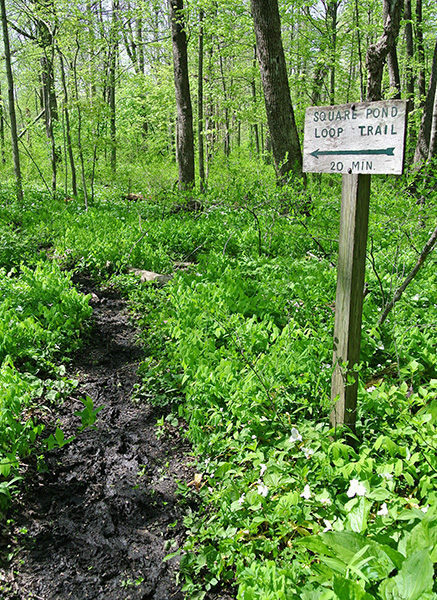 The Main Trail is the left-hand fork marked by blue blazes that descends to a bridge over the creek and then the sanctuary’s extensive boardwalk. At Mile 0.5 you arrive at the posted junction with Square Pond Loop Trail. This quarter-mile spur wraps around the marshy pond for more opportunities to spot wildflowers and birds. The path is well beaten to the pond but more challenging to follow around its backside. From Square Pond Loop Trail, the Main Trail continues on the boardwalk until it finally ends near Mile 1. Within a third of a mile you arrive where a trail signs marks River Trail within sight of a dike along Dowagiac River. At this point it’s hard to spot an actual path to the top of the dike but once on top it’s easy to see the trail that follows it. To the west you can look down at the Main Trail that parallels it, to the east you can see the channel-like Dowagiac River. Either path leads to a break in the dike at Mile 1.6 where a bench with a view of the river is located. A little further along the Main Trail, you swing away from the river, pass a house and road and at Mile 1.8 pop out at Frost Street. Follow the paved road briefly and then re-enter the woods at a spot marked with a “Parking Lot” sign to arrive at a junction with the inner loop, marked with yellow blazes. Head left to reach the trail head in a hundred yards. Other than parking and a bench, there are no facilities at the Dowagiac trailheads. Dowagiac Woods is open year round. There are no vehicle or entry fees to visit the sanctuary. from the town of Dowagiac, head west on M-62 for 3.6 miles and then south on Sink Road. 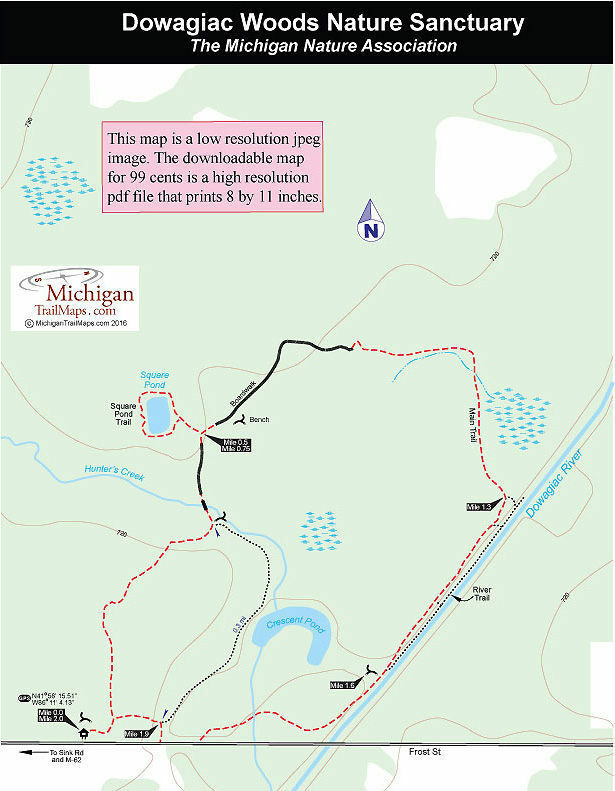 Within a mile turn east on Frost Street and in a half mile the trailhead will be posted on the north side of the road. For more information contact the Michigan Nature Association (517-655-5655; www.michigannature.org).